A group of international scientists is meeting Tuesday to try to convince parliamentarians there is no longer any doubt that common agricultural pesticides are toxic chemicals that are killing off honeybees. In fact, says Jean-Marc Bonmatin of the French National Centre for Scientific Research, neonicotinoid pesticides kill a lot more than just bees, posing a deadly risk to frogs, common birds, fish and earthworms. The scientists represent a task force on pesticides within the International Union for Conservation of Nature, which in 2015 released a comprehensive review of more than 1,100 peer-reviewed research studies on neonicotinoids. Today they release an update to the report. After beekeepers started sounding alarm bells about mass deaths of honeybees, scientists began to zero in on neonics as one of the culprits. Bees were consuming pollen contaminated with neonics as well as flying through chemical-laden clouds of dust from farm fields. But bees, said Bonmatin were only the most "visible part of the problem," because beekeeping is a big business and without bees, billions of dollars of farm crops would go unpollinated. "Beyond honeybees, there are all the wild bees, all these pollinators and behind all these pollinators there are some other invertebrates, the ones living in the soil, flying invertebrates, the ones in the water," said Bonmatin. "Nobody cares about that. There is no money in these invertebrates. However they are giving a huge service to the quality of soil, to all the ecosystem services that we need." Bonmatin, vice-chair of the task force, said evidence from Europe suggests these chemicals don't actually help farmers much. Since Europe clamped down on their use four years ago, there hasn't been a substantial reduction in farm yields. 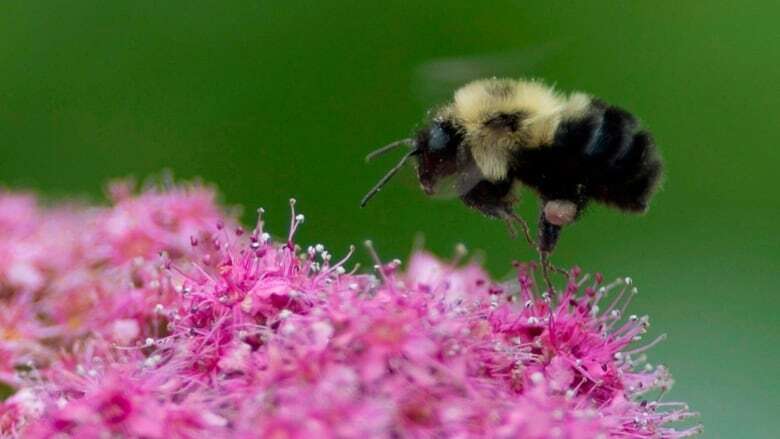 Lisa Gue, a senior researcher with the David Suzuki Foundation which is involved in the release of the updated report, said Canada has to catch up to Europe and ban the use of all neonics. France is phasing in a complete ban on all agricultural uses of neonics, with the full ban set to take effect next year. A year after Ontario's bee industry recorded the loss of 58 per cent of its honeybees in the winter of 2013-14, Ontario began phasing in limits on use of neonics but only for corn and soybeans. Quebec proposed similar regulations earlier this year. Vancouver and Montreal have both banned their use entirely within city limits. Health Canada's Pest Management Regulatory Agency has been studying neonics since 2012 and last fall came to a preliminary conclusion that one of them — imidacloprid — should be banned from use almost entirely after finding it was building up to toxic levels in surface and groundwater and killing aquatic insects that are a source of food for fish and birds. Health Canada isn't expected to make a final decision until at least December 2018. It is looking at the other two most commonly used neonics and is expected to release initial findings in December 2018 and final decisions in June 2019. Gue said even if Health Canada decides next year to ban imidacloprid that phase-in isn't scheduled to even start until 2021. "I do have hope policy-makers and regulators in Canada will see the report as a wake-up call," she said. However, Ron Bonnett, the president of the Canadian Federation of Agriculture, said Canada is not yet at the stage where a ban is possible. Bonnett said there has been a lot of research, but more work must yet be done to introduce alternatives and determine whether the products can be used in a less damaging way. "I'm not sure if we're at the point of the ban yet, but I think one of the things is if there is real strong evidence that the pesticide and the way we're using it is causing harm, we'll have to deal with it," said Bonnett. Bonnett said pests are a significant problem for Canadian farmers, pointing to a study done on potato crops in P.E.I. that showed potato plants grown without the use of any pesticides were just leaves and stems with no potatoes underneath. Bonmatin said since Europe began barring the use of neonics, there has been success at limiting the exposure honey bees have to the toxic chemicals, without a significant reduction in crop yields.